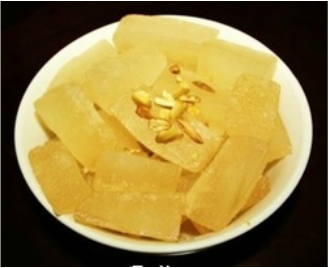 Petha is a very famous sweet in North India. 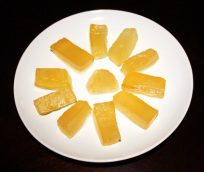 It is translucent like sugar candy usually comes in rectangular or cylindrical shape. 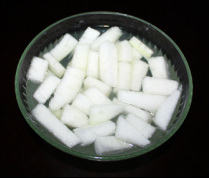 Petha is made with white pumpkin also known as Ash gourd or winter melon. Ash gourd looks like a white watermelon or pumpkin. Its outer skin is green coated with white wax, inside flesh is firm and white, the middle of fruit contains spongy pulp and small seeds. 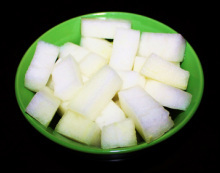 White pumpkin is easily available in many Indian or ethnic super markets. With growing demand and innovation more varieties of petha is available. They come in different shapes and flavors and decorated with coconuts and many varieties of nuts. 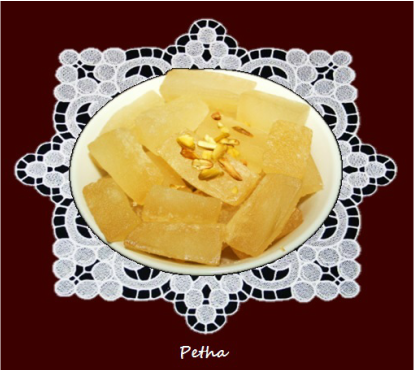 Kesar, petha, Angoori petha are among the most popular pethas. Although petha is made throughout India but the petha from Agra is the most famous, just the name Agra itself reminds us of petha. 1. 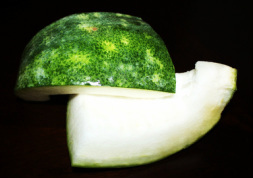 Peel off the green thick skin of the white melon and remove its seeds and spongy pulp. Cut the melon into desired size and shapes. 2. Spread the melon pieces on a cutting board and with a knife or a fork prick the melon pieces. 4. 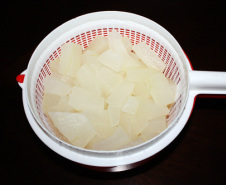 Once the petha is cooked take it off the stove and transfer it into a colander and drain all the water and immediately wash it thoroughly under cold water several times so that thee is no trace of the alum remains. 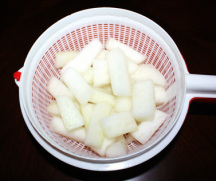 Leave the petha in the colander for a while so that all the water drains out. 5. While petha is boiling prepare the syrup. 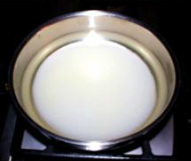 In a pan add sugar and half cup of water and boil for 12 to 15 minutes or until syrup become thick of on thread consistency, means when you touch it with your finger it should form a single thread. 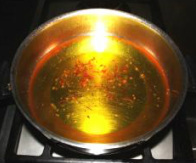 If you are going to add saffron then add when syrup is boiling. 6. 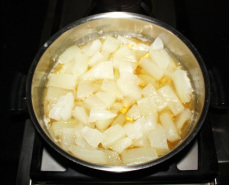 Transfer the cooked petha in the syrup and let it cook. 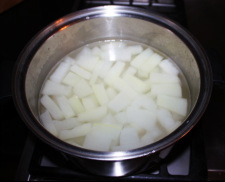 While cooking petha leaves lot of water and syrup become watery, raise the heat so that all the water evaporates quickly. 7 . 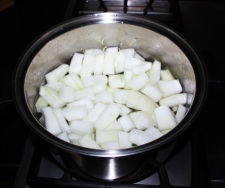 Let the petha cook in the syrup until all the water evaporates and sugar syrup become thick and petha become transparent. 9. 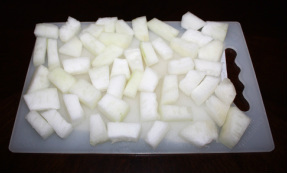 If you are going to make dry petha then take the petha off the heat and arrange in a plate or a try, so that they do not stick to each other and allow it to cool completely. 10. 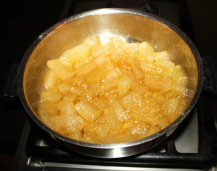 If you are going to keep the petha in syrup then let the petha and syrup cool down then transfer it into a bowl. Refrigerate it or serve it.